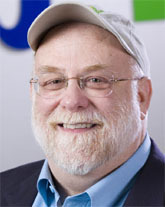 Jim Griffith, known as "Griff" to members of the eBay community, was one of eBay's earliest employees. He's currently Senior Manager of Seller Advocacy for the eBay Seller Experience Team; Dean of Education; author of "The Official eBay Bible, the authoritative eBay guide for the beginning bidder and seller"; and host of eBay Radio. We interviewed Griff to find out what he thinks of the current state of eBay and to see if he could offer specific tips for sellers in the new environment. AuctionBytes: When did you start with eBay? Griff: I started at the end of October, 1996 as eBay's first Customer Support rep.
AuctionBytes: What are some of the biggest changes you've seen taking place on eBay since you started? AuctionBytes: What is the single best change you've seen take place on eBay in your tenure? Griff: The acquisition of PayPal. Griff: Single? Many sellers will say you are letting me off the hook. Let me acknowledge what sellers believe to be the worst (their opinion matters more than mine) and then I will give you my opinion. There were several changes made this year that from the perspective of many sellers would be considered "less than optimal" - and not without justification. For example, the inclusion earlier this year of neutrals in the calculation of feedback percentages was in many ways, probably the worst single change of this year. Although the inclusion made perfect sense from a data perspective (that is, that most neutrals were indicative of a sub optimal experience on the part of the buyer) it was unrealistic to think sellers would support it. They told us, in no uncertain terms, that a neutral is by its very nature, neutral and not a positive and most definitely not a negative. And they were right. We made the wrong move in including neutrals into the positive feedback percentage. We did roll it back but we should have foreseen the illogic of the change beforehand. We would have avoided a lot of unnecessary seller angst. Still, it wasn't any one change that was the worst at least from a seller's perspective. According to what sellers have been telling me this year, there were two overarching aspects of the changes that they view as "worst" and which are directly connected. 2) The overall effect of the changes has left many of them feeling as though eBay views them as somehow bad or unwanted. This particular result is the one that, personally, distresses me the most and what is in my opinion, the worst change I have seen in my tenure here and the one I believe we must remedy immediately. There is a lot more transparency in both the next version of the Seller Dashboard and there are real, solid improvements in the next iteration of the ratings system. AuctionBytes: How has your role changed over the past 10 years? Griff: In 1996, I started out from my location in Vermont as a customer support rep. From there I have been a supervisor and then manager of training in Salt Lake City, a spokesperson, the lead instructor for eBay University, host of a radio show, author of a book and a member of the Community Development team. After the downsizing in October of this year, I requested a move to the Seller Experience team under Dinesh Lathi to help foster advocacy for and greater awareness of the small eBay seller; their needs, concerns, suggestions and challenges. That's what I am doing right now. However, through all my different roles here, one thing has stayed constant: I still answer as much customer email as possible. It's the one role I would never give up. AuctionBytes: Do you think eBay still offers all sellers a level playing field to all sellers? Griff: It can be a lot harder to compete on eBay today than several years ago, but eBay still provides an equal opportunity to anyone who wants to start selling on the site. AuctionBytes: Many vocal sellers and seller organizations such as PESA have been critical of the moves that eBay has made in the past several years, specifically with Best Match and the Diamond PowerSeller Program. Let's handle the last part first. Give us your perspective. Why is bringing aboard Diamond Level PowerSellers a good thing for eBay sellers? Griff: Diamond Level Power Sellers, like all PowerSellers, bring both buyer traffic and a wide selection of inventory to eBay's marketplace. Increased buyer traffic is a potential benefit for all eBay sellers. As a seller, I am all for more traffic. As a buyer, I love the increase in the breadth and selection of inventory. Keep in mind that the Diamond Level is not exclusive nor is it limited to new merchants. Any seller can attain Diamond level status. Some of our existing Diamond level PowerSellers actually started their businesses on eBay and I am confident that many more sellers will reach Diamond Level status on eBay in the future. AuctionBytes: Why did eBay choose to launch the Large Merchant Services APIs in November during the holiday shopping season? Griff: So that those sellers - new and existing - whose businesses could benefit from these services, could implement them in time for the holiday shopping season. AuctionBytes: As an expert in selling on eBay, what are some best practices you'd recommend sellers employ in reaction to the Large Merchants program? Griff: I recommend the same best practices I have always recommended to any seller. The most important: All sellers really must diligently and regularly monitor their categories and their seller competition, specifically listed inventory and price points, so that they can adjust their own inventory and pricing to stay competitive. This is how markets have traditionally operated, both on and off eBay. AuctionBytes: On a scale of 1-10, how would you rate eBay's communication with its merchants? Has it gotten better or worse since you've been at eBay? Griff: Some aspects of our seller communication have improved over the years since 1996. For example, explaining the "how's" of new features or policies as evidenced by the three-day real time discussions and Q and A seller community communications surrounding the August 20th announcements this year and the recent webinar on Best Match. For those, I give us an 8. However, there are other two other specific areas where the quality our communications has diminished; communicating the "why's of changes and again, providing more transparency and access to the data that eBay sellers desperately need in order to manage their businesses day to day and plan for the future. For these I have to give us 2. Final score: 5. And to answer your second question, based on this final score, this year, our seller communications have worsened. AuctionBytes: Best Match is a very different way of presenting products to shoppers on search results pages. What are some best practices for dealing with the Best Match search algorithm? Griff: 1) If you're selling multiple quantities of identical items, keep in mind that "recent sales" factors heavily in the Best Match algorithm. Breaking up multiple quantities into many separate listings can actually work against a seller trying to gain ranking advantage in a Best Match search. 2) Since Best Match treats Fixed Price and Auction format listings differently, make sure you employ the right format for your items. Some types of items benefit more from Fixed Price. Some benefit more from the Auction format. And many sellers find a balanced mix between the two works best for them. 3) If you aren't sure which format works best, test! In fact, sellers should be constantly testing different listing strategies to determine what does and doesn't work. And when you test, don't just wait for watchers, bids and sales as test data. Go out there and search for your items like a buyer might. AuctionBytes: International sellers often report difficulties in keeping high DSR scores due to the challenges of cross-border trading (delivery delays, customs, and higher shipping costs). What are some best practices for coping, and do you think eBay could do something to alleviate how these problems affect sellers' DSR ratings? 1) If you are making your items available to Europe, have your terms of service professionally translated into at least French and Spanish. (don't rely on online translators only. They can give horrible, unintended results.) Make sure the translations appear in all your listings open to international buyers. 2) Include a clear, unambiguous statement regarding customs and any possible duties or taxes that might be assessed on the item and for which the buyer is responsible. Leave nothing open to assumption. 3) Provide a table of "worst case" delivery times for each class of service to each country location. I see this more and more with CBT sellers, especially those based in Japan for some reason, and it does seem to mitigate the likelihood of a lower DSR rating. 4) To the extent possible, pro-actively communicate with your CBT buyer at about or a day or so earlier of the date that the item should have arrived. Nothing soothes the suspicions of a CBT buyer like an unexpected email from a seller asking if the item has arrived. It shows that you are there and that you are concerned about the delivery. This is one area where the low volume seller can beat the high volume seller since it is always more of a challenge for a larger seller to send out personal, pro-active emails. AuctionBytes: Do you think it's possible to survive as an online seller by listing exclusively on eBay? Griff: Yes. Many are. And many sellers of all sizes sell on their own website or another marketplace as well as on eBay. Of course, I love it when a seller sells successfully and exclusively on our site but I fully support whatever selling channel strategy and mix that helps a seller achieve greater success for their business, even if it means they don't sell exclusively on eBay. AuctionBytes: As moderator of the eBay Town Hall meetings, can you tell us whether we can look forward to any more such events? Griff: Starting in January of 2009 and going through the first half of the year, we will host a Town Hall on the second Wednesday of every month. The first will be on Jan 14th. We will announce this first Town Hall after New Years. And I should add, we are not eliminating or closing our discussion forums. Community discussion forums are here to stay on eBay. In fact, we are making an investment in the discussion forum platform in the coming year. AuctionBytes: What type of role do you hope to have with eBay in 5 years? Griff: I hope that well before five years, my current role fostering Seller Advocacy will become unnecessary. That certainly is my goal. After that, if there is a role for me in the future eBay, I suspect it will be similar to the one I have now; helping sellers adapt to the ever-changing eBay marketplace. It's the role I like best.